I asked for some of the Virgin Mojito range from The Body Shop for my birthday in June and I happily received three of them. I would have liked some sort of bath product to be included in the range along with the usual scrub, shower gel and moisturiser. I feel like a bath bomb or bath jelly would have worked really well with the mojito scent. I love the lime and mint scent as it's so refreshing and just smells like summer in a bottle. I also like that each product has a slightly different scent and the scrub smells slightly more like cucumber. Virgin Mojito Body Scrub | £15 // I really like the gel texture this body scrub has and it feels very cooling on the skin. If you've read any of my other reviews on TBS body scrubs then you'll know my opinion on them varies a lot. This is definitely not the most abrasive scrub I've tried, but does actually feel like it's doing something to my skin. You do have to rinse the bath out afterwards as the tiny beads in it do not dissolve in the water which I don't think is necessary as sugar or salt scrubs work even better than beads. 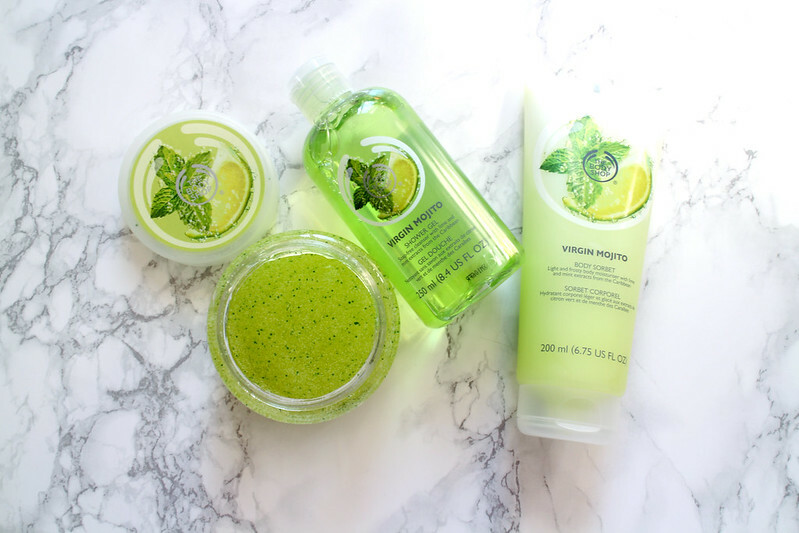 Virgin Mojito Shower Gel // This doesn't seem to be on their site at the moment so may just mean it is temporarily unavailable and I assume they'll be bringing it back at some point. I really like TBS shower gels as they're pretty cheap if you use a discount code. They smell amazing, this one is no exception, and they also don't dry my skin out or irritate it. Virgin Mojito Body Sorbet | £ // This is actually the first body sorbet I've tried from TBS although other scents were released last year, I just never got round to buying one. It has a really different texture to the standard body lotion. It definitely feels more like a gel than a cream, but I wouldn't say it's a gel if that makes any sense! It sinks into the skin incredibly quickly. I imagine this sort of moisturiser would work really well on on sunburnt skin once it as settled down a little bit. Luckily so far this year I haven't burnt my skin so I can only guess. This probably wouldn't be heavy enough for my skin during the winter, but it's perfect for me during the summer. I hate applying a moisturiser and then having to put clothes on when it hasn't really sunk in probably. I haven't had this problem so far when using this and it almost gives my skin a matte sort of feeling once it's rubbed in.